Make no bones about it, the three 150-million-year-old diplodocid sauropod dinosaur skeletons are the biggest - both metaphorically and literally - stars of the spanking new Lee Kong Chian Natural History Museum (LKCNHM). But if I thought that Singapore’s first and only natural history museum is all about Prince, Apollonia and Twinky (these are the names given to the three dinosaur fossils by the way) before my visit, I was proven wrong. 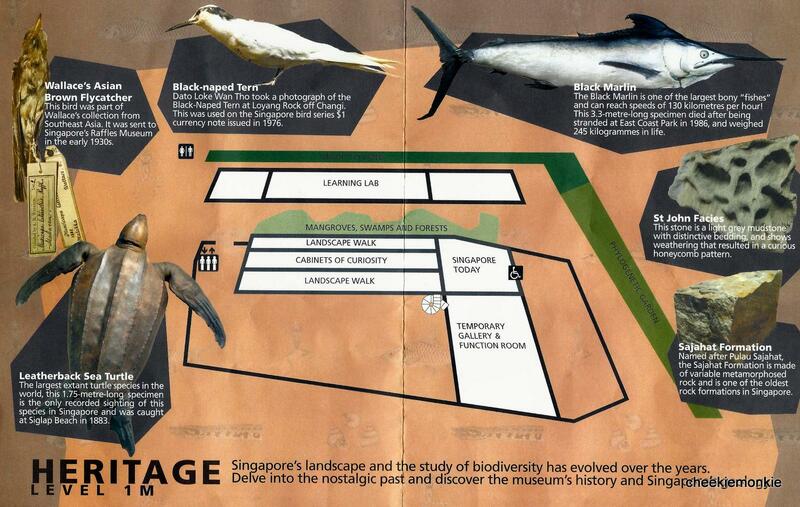 Located beside the University Cultural Centre at Kent Ridge and opposite Raffles Hall, the LKCNHM traces the history of life on earth - from the microscopic to the enormous, and from the queer to the awesome. 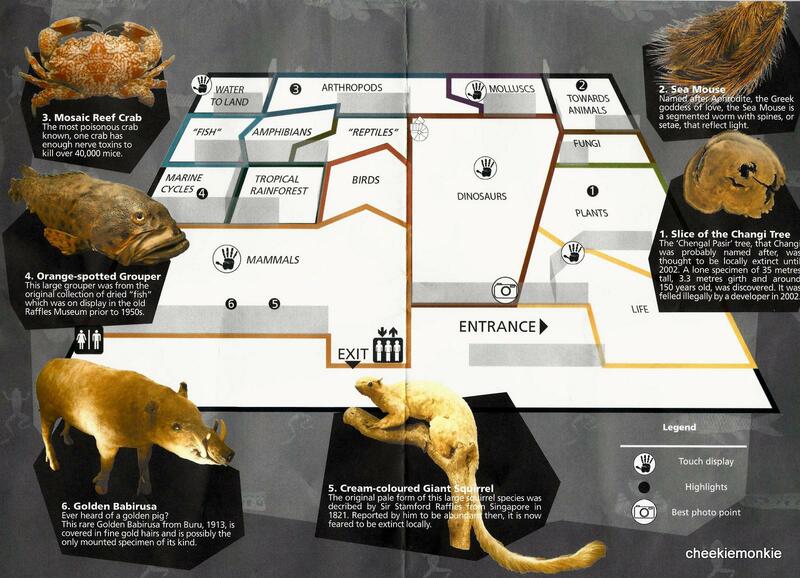 With 20 zones spread over two floors, it is home to more than 500,000 Southeast Asian animal and plant specimens. With so many exhibits on display, it can get a bit mind boggling and overwhelming when stepping into the museum for the first time. The museum is definitely made for repeated visits as the boys and I did not even manage to cover everything in detail after spending 2.5 hours there. So I thought I will offer my review in the form of pointers so that families will be able to maximise their time spent at the museum. First things first, do NOT go to LKCNHM without purchasing your admission tickets beforehand. Tickets are not sold onsite as all admission tickets can only be purchased from SISTIC, either online or through its authorized agents. Visitors choose to print out their e-tickets or collect them from SISTIC’s authorised agents. Admission tickets are available for pre-booking up to one month in advance. Standard ticket prices are $21 and $13 for adults and children respectively. Local resident rates are priced at $16 for adults and $9 for children (3-12), students, Senior Citizens and NSFs. *Prices are inclusive of $1 SISTIC booking fee. Unlike the usual museums, the opening hours of LKCNHM (10am to 7pm) are divided into 6 different sessions, each at a 1.5 hours interval, with the first at 10am and the last at 5.30pm. What this means is you will have to choose your time slot at the point of purchasing the tickets. Each slot can take about 200 people and the rationale behind this arrangement is primarily to maximise each visitor's viewing experience, as large crowds and long queues are not the best environments to enjoy history and science. However, visitors are free to remain within the museum for as long as they want once inside the museum. But do note that re-entry is not allowed. The LKCNHM exhibition gallery is divided into 2 floors, with the Biodiversity Gallery located at the lower first floor being home to fifteen thematic zones, such as Mammal Zone, Arthropod Zone, Birds Zone, and of course, the Dinosaur Zone. The Heritage Gallery is located at the mezzanine floor and includes five exhibit zones, which pays homage to LKCNHM's heritage. The gallery presents an account of the museum’s development and traces the relationship between Singapore’s development and natural history. After going through both galleries and judging the responses from Ash and Ayd, I have to say the first level gallery intrigued them so much more. This is due to the presence of numerous hands-on interactive and interesting exhibits which appeals to younger children in a greater way. But that is not to say the Heritage Gallery does not have some gems up its sleeve. For starters, the gallery includes a real specimen of a Leatherback Sea Turtle - the largest extant turtle species in the world - which was caught at Siglap Beach in 1883 and remains the only recorded sighting of this species in Singapore til today. The Heritage Gallery's layout is intentionally styled like an old-school museum with specimens on display in dark wooden cabinets in the Cabinets of Curiosity zone. The rows of cabinets hold curios and collectibles, some of which had survived the war years after 1942. What is interesting about the cabinets is visitors are able to open various cabinet doors to reveal more exhibits, as well as looking up the exhibits' information via tagged numbers on cars in the cabinet drawers. Humans can be so strange at times. When we are spoon-fed with the information plastered right beside the exhibits, we tend to just glance over them. But when the exhibits merely display numbers, we go out of our way to hunt for more information via the information cards in the drawers. A very ingenious way of getting visitors to search for information I have to say! One interesting thing I learnt was that Sir Stamford Raffles was a very avid naturalist who loved animals and plants. He had a hand in mooting the idea of having a natural history museum in Singapore, which eventually led to the construction of the National Museum on Stamford Road - the original home of Singapore's natural history collection, the Raffles Museum. In fact, did you know that Raffles was responsible for identifying the Sun Bear, the world's smallest bear? The gallery also has a zone titled 'Singapore Today', which showcases the geology of our island as well as the important conservation work done by national agencies. Kids get a chance to have a feel of the different types of rocks deep within Singapore's land too! Also on the same level of the Heritage Gallery, visitors will be able to sneak a peek through windows to see a strip of vegetation which comprises of mangroves and freshwater plants. As they walk further down, the vegetation leads to a zone of dryland rainforest plants, which highlights the natural transition of vegetation. It will be hard to deny that the first level of the museum will be a hit with children aged 12 and below. While the Heritage Gallery above is super informative filled with exhibits of historical significance, it is the Biodiversity Gallery that will capture the hearts and minds of children - especially if they are into the science of biodiversity, like my 2 boys. The entire floor consists of a whopping 15 zones, showcasing life on earth's history. Each section is devoted to the origin of life and form a major branch of the Tree of Life, including plants, fungi, molluscs, arthropods, “fish”, amphibians, “reptiles”, birds, and mammals. Other informative sections include one which demonstrates how terrestrial vertebrates evolved from “fish” as well as another explaining why birds are actually dinosaurs! I recommend viewing the zones in an anti-clockwise manner, starting from the 'Plants' zone right after entering the museum. This makes it easier to follow the journey of evolution of the natural world, from simple life forms to complex organisms and absorb the diversity wonders zone after zone. It definitely helps too that the zones are clearly segregated by totem poles which give parents a crash course of the various sections. You know, just in case the kids ask too many questions. The display of carefully-preserved exhibits of animals clearly stoked the boys' interest most. That, and some exhibits which gave them the opportunity for a hands-on experience to see how they felt like. The Arthropods zone was one zone where we spent the longest time thanks to its interesting exhibits like the fossils of trilobites, a marine creature that existed before the dinosaurs and the world's largest crab - Japanese Spider Crab. Right down to the world's smallest crab. It's the Coral Spider Crab in case you are wondering. The sheer amount of specimens on display is truly staggering... and beautiful, in their own tiny ways. At the 'Water to Land' zone, do not miss the exhibit which compares the leg of an Asian Elephant and the fossil leg of a triceratops! Another biggie that you cannot miss is the huge crocodile specimen at the "Reptiles" zone, which was actually from Sungei Serangoon in Singapore! Check out the cast replica of the Archaeopteryx fossil at the 'Birds' zone, which shows both reptilian and bird-like features. Its significance? It is the earliest known bird and helped prove that modern birds evolved from dinosaurs and was the first example providing support for Darwin's theory of evolution. Make a stop at the 'Tropical Rainforest' Zone where visitors will be able to watch a video to learn how animals have adapted over the years so as to 'fly' between the forest canopies, much like the flying squirrels. The final zone in the anti-clockwise walk will bring visitors to the 'Mammals' zone, where it is full of taxidermied specimens that look almost alive and straight out of the 'Night at the Museum' movie. Well, skeletons and skulls too, just for that encompassing experience. One highlight is the nine-foot long tusk from a narwhal, a medium-sized whale which sports a long protruding canine tooth from its forehead earning the nickname of the 'Unicorn of the Ocean'. The 200-year-old tusk was gifted by the Russian government to businessman ''Whampoa'' Hoo Ah Kay, one of Singapore's pioneers of the 1800s. Without a doubt, this zone deserves a separate mention on its own. The three diplodocid sauropod skeletons - nicknamed Prince, Apollonia and Twinky - were found between 2007 and 2010 at a quarry in Wyoming in the United States and are believed to be part of a herd or even a family. Each of them is about 80% complete, making them one of the most intact fossils ever found. Apollonia and Prince measures 24m and 27m respectively, while the baby Twinky is 12m long. Even more amazing is that two of these skeletons come with skulls – a rarity as far as sauropod dinosaurs fossils are concerned! Although the original bones have pieced together and mounted for display, the skulls of the dinosaur skeletons are cast replicas. This is due to the fact that the actual skulls are too heavy to be mounted and the fossil company which oversaw the archaeological dig wanted for the skulls to remain partially embedded in rock so that kids (and adults) could see how an actual fossil discovery looks like. Apollonia’s original skull can be viewed in a glass case beside the dinosaur skeletons. For the curious, kids can also feel a real dinosaur bone for themselves! The thighbone belonged to an Edmontosaurus, a flat-headed duck-billed dinosaur. Other interesting exhibits include laying hands on a piece of meteorite and viewing the skull and bones of a real dodo bird. Throughout the day, the dinosaur zone also displays a Dinosaur Light Show every half-hourly. Do not expect the dinosaur skeletons to start prancing around or nodding their heads though. The light show consists of flashing lights and sound effects which makes the dinosaur-viewing experience a more immersive one. Scattered around the museum are various booths that appeal to the various senses. These include videos of rare and interesting animals (check out the Birds of Paradise one at the 'Birds' zone!) and multimedia booths where visitors learn more about the researchers' work at the museum. Let your feet take a breather via the seating booth where visitors can hear the different sounds of animals and insects make. Within the museum, toilets can be found on the second floor (Heritage Gallery). There are also toilets located outside of the ticketed museum area, as well as a baby care room. The baby care room comes with 2 changing stations, a hot-and-cold water dispenser and a chair. Do note that for LKCNHM, there is no re-entry after one has exited the museum so head to the washrooms on the second floor while still inside. A Museum shop selling soft toys, dinosaur crafting kits, sweets and drinks is located beside the washrooms in the public area. At the public area too, is a skeleton of a Indo-Pacific Humpbacked Dolphin whose carcass was found washed up at East Coast Park Beach on 19 July 2014. My final take on Lee Kong Chian Natural History Museum? It is a must-visit for families! Even though some of the exhibits' significance or meaning could be lost on the younger ones, the experience of being able to view specimens - and giant dinosaurs skletons too! - at such a close proximity is truly an enriching one. While the museum showcases the diversity and history of life on Earth, it also serves as a sombre reminder of how much more of life on Earth remains to be cherished and protected. *All prices are inclusive of $1 SISTIC booking fee. *No sale of tickets at the Lee Kong Chian Natural History Museum. All tickets to be purchased from SISTIC, either online or through its authorized agents. *NUS staff and students can enter for free, but are required to sign up online HERE. Driving: Limited parking at the LKCNHM. More parking available at Yong Siew Toh Conservatory of Music and Raffles Hall. Hello, how far is it from the MRT station to the Museum? Is it easy to find a taxi there? I am not from Singapore, but I will come next week and would like to visit the Museum. The MRT station is still quite a distance away from the museum - it's at least a 30-40 min walk away. My suggestion is to take bus no. 96 from Clementi Bus Interchange (next to Clementi MRT station). Hi, any food establishments at the Museum? No, there isn't any food establishments at the museum when I last visited. Update: Just visited the place today. They now sell tickets on site, although they still recommend booking in case of overwhelming demand. Most weekdays I'd imagine that getting tickets at the door should be no problem. Hope this helps. It was a great experience, and thanks to you for your useful review as well.